At around 3 p.m. (JST) on December 20, 2018, a fixed-wing patrol aircraft (P-1) belonging to the Fleet Air Wing 4 of the Maritime Self-Defense Force (MSDF) (Atsugi) conducting intelligence collection and warning and surveillance was irradiated by a fire-control radar from a Republic of Korea (ROK) Navy's destroyer off the coast of the Noto Peninsula. Fire-control radars are directed at its target immediately before firing, and to aim it at foreign aircrafts is an extremely hazardous act that may cause unintended consequences. Regarding this incident, on January 21, 2019, the Japanese side has decided to summarize and make publicly available the Ministry of Defense (MOD)'s final position based on the objective facts as possessed by the Japanese side along with the recordings made by the MSDF aircraft at the time of the incident. The MOD once again strongly protests against the ROK destroyer's fire-control radar irradiation, and strongly urges the ROK side to admit the facts of this incident and to take thorough measures to prevent its recurrence. At the same time, given that the ROK side refuses to conduct an objective and neutral determination of facts, it is unlikely that the truth will ever be made clear even if working-level meetings were to continue, the MOD deems that it has become difficult to continue to hold consultations with the ROK side regarding this matter. We hope that this announcement will lead to the prevention of similar incidents in the future, and we will continue to make sincere efforts toward continuous Japan-ROK and Japan-ROK-U.S defense cooperation. (around 3 p.m. (JST)): A fixed-wing patrol aircraft (P-1) belonging to the Fleet Air Wing 4 of the Maritime Self-Defense Force (MSDF) (Atsugi) conducting intelligence collection and warning and surveillance was irradiated by a fire-control radar from an ROK Navy's destroyer off the coast of the Noto Peninsula. The Ministry of Foreign Affairs (MOFA) lodged a strong protest against the ROK. The MOD made a public announcement regarding this incident (first announcement). The MOFA once again lodged a strong protest and urged the ROK to prevent recurrence. 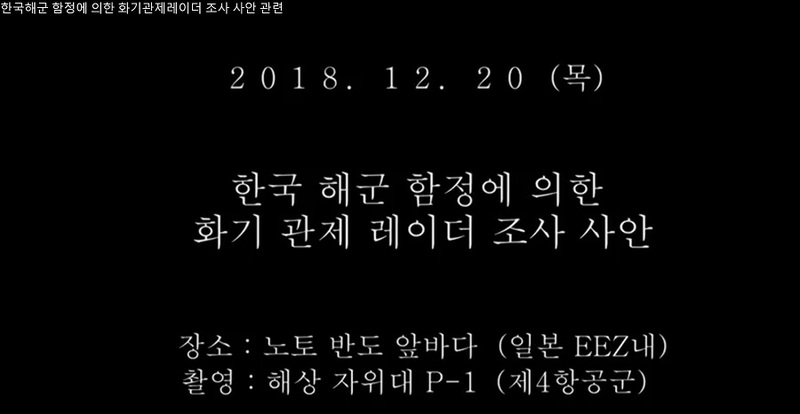 The MOD, based on news reports from the ROK, made a public announcement regarding MOD's view on the incident (second announcement). The ROK announced its view at the ROK Ministry of National Defense's press conference. On the same day, at the Japan-ROK foreign ministry bureau chief-level talks, the Japanese side expressed its regret and urged the ROK to prevent recurrence. It was decided that both governments, including defense authorities will discuss. The MOD once again made a public announcement regarding MOD's view on the incident (third announcement). The MOD released on its website a footage taken by the MSDF P-1 patrol aircraft (fourth announcement). The ROK demanded an apology for the MSDF P-1 conducting "a threateningly low-altitude flight" at the ROK Ministry of National Defense's press conference. The ROK released a video of its counter-arguments against Japan. On the same day, the MOD released its views (fifth announcement). At the Japan-ROK foreign ministers' phone talks on the same day, it was agreed that it is important that defense authorities discuss the issue based on facts and resolve it at the earlies possible date. January 21: The MOD summarized and made publicly available the Ministry of Defense (MOD)'s final position based on the objective facts as possessed by the Japanese side along with the recordings made by the MSDF aircraft at the time of the incident (sixth announcement).